Kohlrabi is a crispy, sweet tasting, delicate flavored member of the Brassica family of vegetables, grown for its swollen, turnip-shaped portion of the stem which rests on the ground. It is not a root, but a thickened, enlarged stem, with smaller, leafed stems shooting up from the top. It’s a distinctive looking vegetable, with a ball-like shape, pale green and purple-tinged. The flesh of the bulb is juicy and crisp with a beguiling sweetness similar to that of an apple, with a hint of piquancy associated with radishes and baby turnips. Kohlrabi is a good source of vitamin C and potassium and is low in both sodium and calories. Kohlrabi is a member of the Brassica oleracee (crucifer) family. Though its name references relation to the turnip, which is a root vegetable, it is not a root vegetable. Members of the cruciferous family have stems and bulbs that grow and rest above ground. 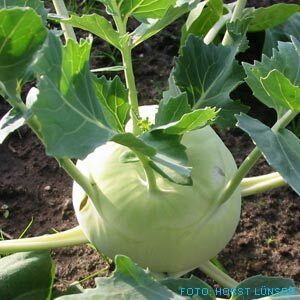 Kohlrabi, along with other cabbage members, is a cultigen that was bread from the wild cabbage plant. The swollen bulb of the kohlrabi plant is the part of this vegetable that is considered the most virtuous element of the plant. It is roughly rounded and somewhat heart shaped, its skin wrapping around itself in a circular motion with several thick stems that branch out into its edible leaves. Although the bulb’s skin is pale green, its flesh is the color of ivory. The bulb is crisp, dense, succulent and similar in flavor to a turnip, with mild cabbage nuances. The leaves and stems are both succulent and tender. The ideal kohlrabi crop should be harvested with bulbs that are three inches or smaller in diameter. Kohlrabi responds wonderfully to nearly all cooking methods. It can be shredded raw in slaws and salads, roasted or braised then pureed into soups, pickled, baked, or stir fried. Both the bulb and the greens make a delicious curry. Diced it makes a hearty addition to savory pies and casseroles. Kohlrabi or knol-khol or German Turnip is a stout, round, tuberous vegetable of the Brassica family; same as that of cabbage, broccoli, cauliflower, kale, collard greens, and brussels sprouts belongs to. This stem vegetable is native to Europe. Scientific name: Brassica oleracea (Gongylodes Group). Knol knol is a perennial, cool season vegetable. It is grown all over the temperate climates for its succulent round shaped modified stem as well for its turnip-flavored top greens. Leaves: Separate the leaves from the stems. Wash leaves, then refrigerate both the stems and leaves in the crisper section in a sealed reusable container, salad spinner, or plastic bag. The leaves will last two to three days. The stems will last one week. Globes: Place unwashed globes in a sealed reusable container or plastic bag in the crisper section of your refrigerator for up to ten days. This attractive stem vegetable is available at its best during winter months from November until March. Over maturity as well as exposure of crop to excessive sunlight makes the stem woody and tough in texture resulting in its poor eating quality. Fresh kohlrabies should have crunchy texture and impart rich flavor. In the stores, buy medium-sized, fresh tubers and heavy in hand for their size. Avoid those with cracks, cuts, spoiled or mold infested. Do not buy if they have lighter weight for their size and excessively woody in consistency as it indicates signs of over-maturity and unappetizing. Knol-knols exhibit good keeping qualities and can be placed at room temperature for 2-3 days. However, If you wish to store for few more days, then keep them in the refrigerator set at temperature below 35 degree F and high humidity level to maintain vitality. Wash kohlrabi just before using. Small kohlrabi bulbs which are young and tender generally do not require peeling and are delicious eaten raw. Medium to larger sizes should be peeled to remove the protective outer skin. The bulb can be sliced, cut into quarters, cubes or julienne strips and steamed until crisp-tender. Or sauté kohlrabi in butter or olive oil, or boil and mash like potatoes. The whole peeled kohlrabi can be added to braised dishes and stews. The crisp flesh can be served raw in salads, as a relish, or as a crunchy accompaniment to dips. Kohlrabi bulbs can also be hollowed out and stuffed with a vegetable or meat filling. Substitute kohlrabi in recipes calling for radishes. Grated kohlrabi can be added to slaw, but lightly salt it first and let stand for several minutes. Squeeze to remove any excess water before adding dressing. Kohlrabi can also be steamed or boiled. For this preparation don’t peel until after they are cooked. Steam or boil until bulbs are tender, peel skin, and season with butter, salt, and pepper, a cheese sauce, or just enjoy plain. The kohlrabi has delicious leaves that are tender and excellent in salads or stir-fried. The leaves can be cooked like collard greens. Wash the leaves and remove the ribs. Blanch in boiling water until just wilted, 3 to 5 minutes. Drain and squeeze excess water from leaves. Chop leaves, then sauté in a little olive oil or butter. Season with salt and pepper. Add a splash of vinegar or squeeze of fresh lemon juice. Kohlrabi stems should be washed thoroughly in clean running water and swish in saline water for about 10-15 minutes in order to remove any surface soil, dirt and any insecticide/fungicide residues. Just before cooking, remove any leaves and trim the stem ends. Peel the skin using paring knife. Kohlrabi, soybean curd (tofu) soup. Peeled stem, cut into slices or cubes, can be mixed with other vegetables like potatoes and stewed with onion, garlic and tomato. The following nutrition information is for ½ medium sized kohlrabi (85 grams). Fresh kohlrabi stem is rich source of vitamin-C; provide 62 mg per 100 g weight that is about 102% of RDA. Vitamin C (ascorbic acid) is a water-soluble vitamin and powerful anti-oxidant. It helps the body maintain healthy connective tissue, teeth, and gum. Its anti-oxidant property helps the human body protect from diseases and cancers by scavenging harmful free radicals from the body.